Timothy J. Mohin is a corporate insider. 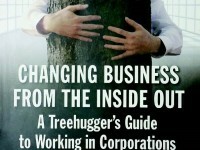 He brings this perspective to his 2012 book, Changing Business From the Inside Out: A Treehugger’s Guide to Working in Corporations. His book, which explores how corporations can do well by doing good, is part business guide and part employee handbook. Having spent the first decade of his career working for the Environmental Protection Agency and in the U.S. Senate, Mohin later worked at Intel, Apple, and Advanced Micro Devices (AMD). He is currently the Director of Corporate Responsibility at AMD. His book provides practical guidance to people who want to work in the field of corporate responsibility. It covers the skills, processes, and actions required to succeed in this growing field. Corporate responsibility is defined as balancing the “triple bottom line” which is essentially “people, planet, and profit.” Our team monitors, manages, and communicates with the public about the company’s behaviors in several areas, including environment, ethics, labor issues, supply chain responsibility, and others that together make up the reputation of our company. We help attract social investment to the company as well as build and protect the company’s reputation with customers, employees, and other stakeholders. Today’s corporate responsibility practitioners may have risen through the ranks in a technical field like engineering, environmental compliance, or health and safety. Or, they may have started out in public affairs, government affairs, or community relations. Today, many companies have dedicated corporate responsibility staff embedded in one of these areas. Mohin outlines skills for success which are useful skills in any field: be flexible and curious; maintain your core competency while learning new skills; communicate; lead through influence; read the system; make change less painful by focusing on the ways it improves profitability or efficiency; be entrepreneurial; pay attention to detail, discipline, quality, and results; and, above all, have passion for the cause. Mohin’s treatment of his subject is thorough, yet concise. At 264 pages, the entire book is direct and on point. Later chapters deal with specific areas, such as environmental responsibility, supplier responsibility, relations with stakeholders and investors, employee engagement, diversity, governance, and ethics. In addition, Mohin details the methods and processes of communicating progress toward corporate responsibility goals to various stakeholders. Filled with just enough real-life examples to clarify and illustrate the concepts presented, this book reads well as both a practitioner’s reference and an overview to a curious outsider. In addition, it can be a critical tool to those evaluating career options. Your college-age children torn between a desire to do good work and the need to make a good living would be an excellent audience for this book.